Edwise provides incomparable training in IELTS, TOEFL, PTE, GRE, GMAT, SAT and ACT test preparation in 24 branches across India. Our renowned faculty ensures you achieve the best scores possible. Every student is unique and we follow a mentoring model where every student is assigned a personal mentor who steers the student towards success. Our classes comprise of small batch sizes, ensuring personalized attention. Faculties are available all throughout the course to solve personal doubts and questions. Our well planned curriculum seeks to make the student a master at problem solving. We follow a flexible approach allowing student’s personalized coaching, make up classes, extra classes as well as numerous mock tests throughout the course. Our innovative and new age teaching methodology has allowed us to attain an exceptional track record in the area of study abroad test prep. Batches commence every week and the courses are result oriented. We also have a well stocked library that consist of Kaplan, Barrons, Cambridge, Princeton publications available. TOEFL is a standardized English proficiency test that assesses English Language skills in the areas of listening, reading, writing and speaking. IELTS is a globally recognized, standarized English Proficiency Test that assesses English Language Skills in the areas of Listening, Reading, Writing and Speaking. PTE Academic is 3 hours long and is split into timed parts. When the time is up on the section, the test will move on automatically. There are 20 different types of tasks. GRE is a world renowned admission test required to be given by those candidates who wish to seek admission to graduate programs primarily in the areas of Engineering and Sciences at educational institutions in USA. GMAT is a world renowned admission test required to be given by the candidates desirous of taking admission to Graduate Management programs at management education institutions throughout the world. 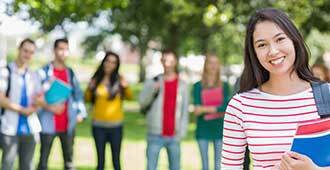 SAT is a distinguished admission test required to be given by the candidates who wish to seek admission to undergraduate programs primarily in USA. ACT is a leading college entrance exam that evaluates a student's readiness for college. It helps measure what you learn in high school so as to determine your academic readiness for college.